For centuries, unarmored combat with the sword and a small shield, or buckler, was one of the most wide spread martial arts of medieval and Renaissance Europe. Now, one of the world’s oldest documented fighting traditions is presented by one of the world’s most respected schools of European swordsmanship in this in-depth, professionally filmed instructional DVD and companion poster! Be guided step-by-step through the fundamentals of body mechanics, tactics and fencing theory in this 85 min DVD, and then learn how to map out a series of attacks, defenses and responses by referring to the beautifully illustrated, durable 14 x 28 full-color poster depicting potential actions from the 700 year old, Royal Armouries Ms. I.33. 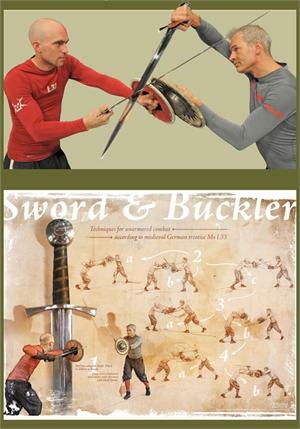 The Sword and Buckler Training package is available now for only $44.95, but only for a limited time – so act now!